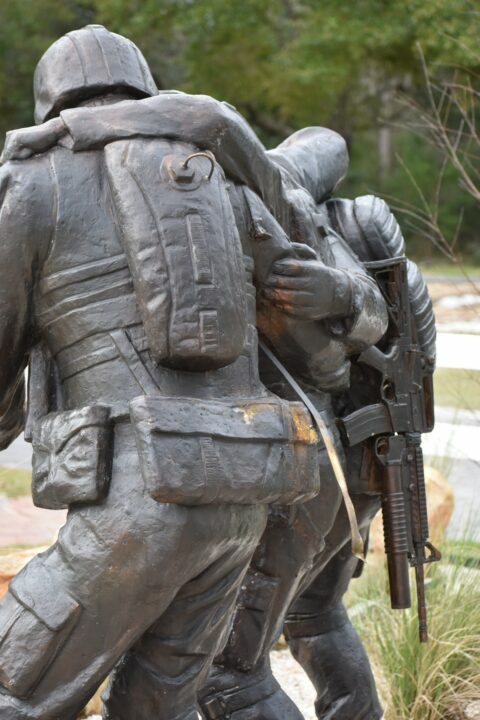 FREEPORT, Fla—A bronze rifle is ripped from a veterans memorial park in Freeport and now the Walton County Sheriff’s Office is asking for assistance in identifying the culprit. On January 21st a resident called deputies after finding a bronze M16A2 rifle replica in a wooded area on his property. The gun was from the Veterans of War Memorial located at Freeport City Hall. Deputies later visited the park and observed the replica was forcibly removed from a statue located at the rear of the park. Damage was made to two separate places on the back of a figure of three service members where the bronze rifle had been welded. The statue was donated to the park in November of 2018. There is no specific timeline of when the vandalism may have occurred. The replica was returned to the Chairman of the Veterans of War Memorial Committee and arrangements are in the process for having the statue repaired. Anyone with information on a possible suspect is asked to contact the Walton County Sheriff’s Office at (850)-892-8111 or you can remain anonymous by calling Emerald Coast Crime Stoppers at (850) 863-TIPS. Submit a web tip at http://www.emeraldcoastcrimestoppers.com/ or send a mobile tip using the P3 Tips Mobile Application.